Review Your Pedals and Win! Home » Miscellaneous » Review Your Pedals and Win! By now, lots of you have heard that we have a giveaway going on for an EarthQuaker Devices Afterneath. We’ve already done two big layouts with a ton of information about EarthQuaker, the Afterneath and how you can enter by reviewing pedals at Pedal Finder. You can check out all those winning details here. Instead I wanted to chat a little bit about how to leave a review for your pedals. Although it seems like an easy process, its just as easy to get lost on the way. So here is the step by step process of getting your review up on the site. Step 1: First off, you need to become a member of Pedal Finder in order to leave a review and have it count towards the giveaway. You can go here to sign up and create an account. Look in the upper right corner and click on Login. A popup window will appear and in blue on the bottom it will say, “Create Account.” Follow the rest of the questions from there. Step 2: Find the pedal you want to review on Pedal Finder. To do this you just go to the homepage of Pedal Finder and use the quick search function on the right in the middle of the page. I’m going to use the Afterneath as the example, since…you know. Go ahead and type the name of your pedal into the quick search. What might happen is that you’ll type in the name of your pedal, but no results will come up. This means one of two things. Either the pedal you are trying to review is not in the Pedal Finder Catalog, or you (or we) misspelled the name of the pedal. If you try multiple times and you still no results come up. Try typing in the name of the builder. This will bring up the manufacturer page along with a list of all the pedals we have from that builder. If you see your pedal, skip Step 3 and go to Step 4. If you do not see your pedal, go to Step 3. It’s like a choose your own adventure. Step 3: You didn’t find your pedal – so you’ll need to tell us that you need the pedal put in the catalog. This isn’t hard. From any page on the site you will notice “Add a Pedal” up in the navigation bar on the far right. 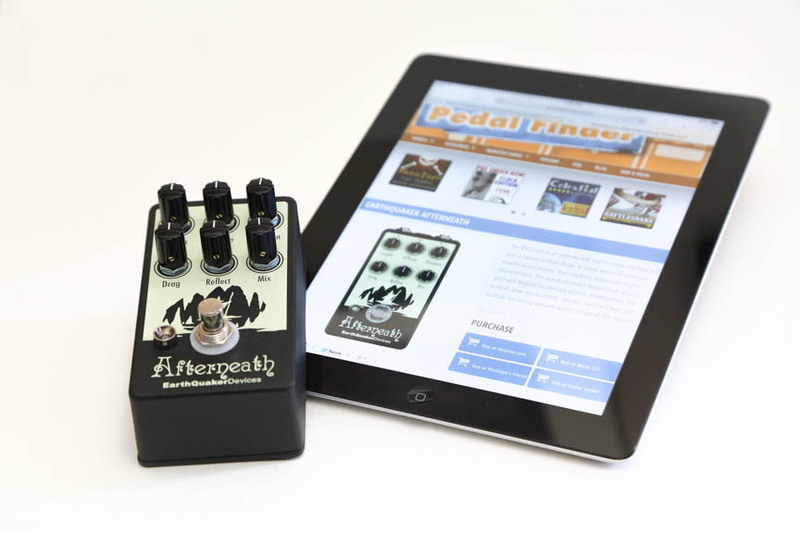 Click that and a pop-up will appear with questions we need from you to get the pedal in our catalog. Answer and provide what you can, we’ll fill in any blanks and make sure everything works out. Just a note, if you don’t see the manufacture from the list, just put the name of the manufacturer in the description field and we’ll get that added as well! 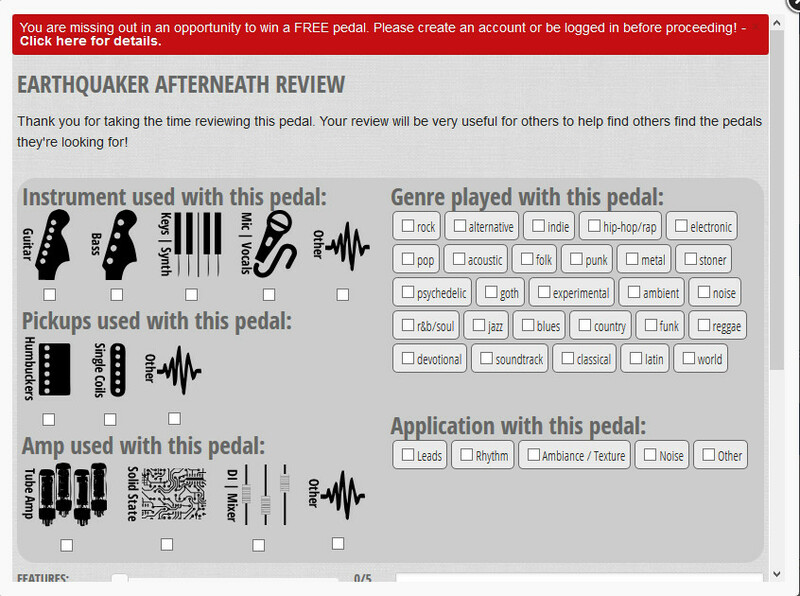 After you submit the pedal for addition to the catalog, give us 24 hours to get the pedal into the catalog. It may be much quicker – especially now with the contest going on. When you come back you just look up the pedal the same way as described in Step 2. Once you find it, proceed to Step 4! Step 4: Review the Pedal! This is the easy part. You should now be on the detail page of the pedal you want to review. There is a big, blue button underneath the picture of the pedal and the reviews that says, “submit review.” Then submit the review. Once the review is approved you will have gained an entry into the giveaway. So that’s how you get through the process of leaving a review. We mostly wanted to point out the process for submitting a pedal in case it wasn’t in our catalog. I hope it makes sense. If you have any questions feel free to contact us or leave a comment. Good luck and thanks! I found mine,it is a pretty easy process.Did a review for Joyo Flanger.Thanks for giving us a chance to win a great pedal.